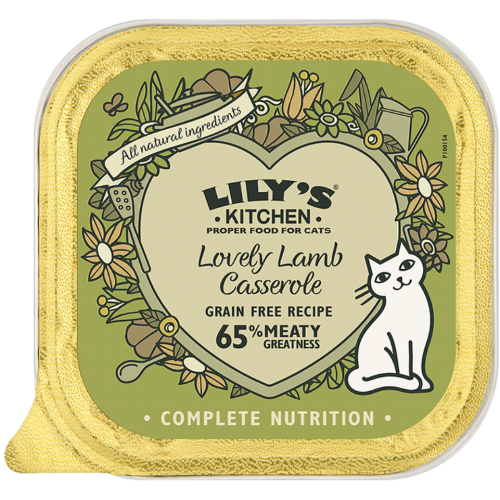 Lily’s Kitchen Lovely Lamb Casserole is a home-inspired, sumptuous dish for your cat. Nutritionally complete, it is made with wholesome ingredients and bursting with the good stuff – meat and offal that your cat thrives on! Containing 65% freshly prepared lamb, chicken and pork, the complementing tastes will keep your cat wanting more! Plus they’ll love the chunky pate texture! This recipe is grain free, meaning it leaves more room for nutrients such as, taurine, which will keep your cat healthy and happy.